Nesomimus macdonaldi Ridgway, 1890, Hood Island (Isla Española), Galápagos Archipelago. 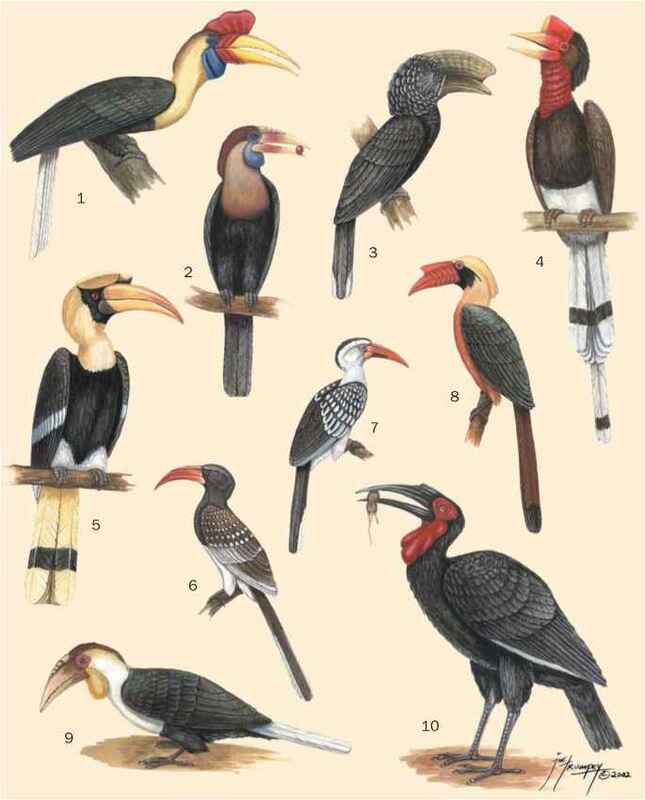 French: Moqueur d'Espanola; German: Galapagos-Spottdrossel; Spanish: Sinsonte de los Galápagos. 11 in (28 cm). Weight not available. Generally variegated dull gray-brown above, off-white below with variable amount of darker spotting on chest. Eye yellow, bill and legs black. 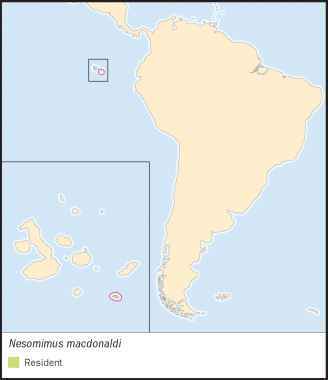 Confined entirely to Hood Island (Española) in the Galápagos, an island measuring approximately 8 mi long and 4 mi wide (13 by 6.5 km). Arid scrub; spends much time in seabird colonies. Totally fearless of humans. The mockingbirds of the Galápagos Islands live in groups, defending communal territories; in the Hood mockingbird the groups are larger than in the other species, at times up to 40 individuals. Groups rapidly adopt any temporary human encampment, investigating unfamiliar objects inquisitively and snapping up any offerings found therein. from animals' fresh wounds or eat congealed blood from the sand. Engorged ticks and skin are picked from live iguanas. The Hood mockingbird has a more powerful bill than other members of the genus, and uses this to predate the eggs of swallow-tailed gulls (Creagrus furcatus), but larger eggs of boobies and albatrosses are only attacked if already damaged. Other food items include invertebrates, vegetable matter, carrion and feces. Groups whose communal territories do not include a seabird or mammal colony have less varied diets. Groups of up to 40 individuals occupy and mutually defend a group territory, intruders being intimidated by consolidated displays of aggression. In less optimal territories (e.g., those without access to colonies), group size is smaller. Little published information on nest and eggs; presumably similar to other species of the genus; the Galapagos mockingbird (N. parvulus) builds a cup-shaped nest in a shrub and lays three to four eggs which are blue-green with brown markings. Not threatened. Within its small range, abundant and not in any obvious hazard. However, introduction of any alien predatory species such as cats would very rapidly change this situation.